Parish Records - now available online! The Genealogist had the widest coverage of records from 1127 to 2005, and all the data is checked by experts for accuracy and quality. 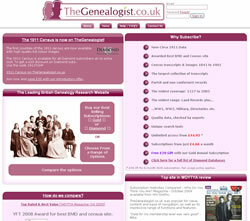 TheGenealogist also offers other records, including Birth Marriage and Death records, Census Indexes and Transcripts, Directories, Army Lists, Crew Lists, Wills & Testaments, Landowner Records, World War 1 & 2 deaths, and more - from only £4.66!